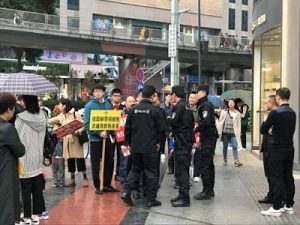 Police in China’s southern Sichuan arrested more than 20 Christians from Early Rain Covenant Church in Chengdu last Sunday as they evangelized on the streets and detained them until evening. On Oct. 20, the church organized a street evangelism team and proselytized on the street as well as held a worship service in a local park. More than 20 of them were taken into custody and held at two police stations. The Christians took turns sharing their faith while at the station. Meanwhile, their fellow church members prayed that they would “be filled with the power of joy, peace, and grace,” and those who were not arrested either continued to preach in the streets or gathered outside of the police stations to wait for news. When the Christians were released, more than 100 fellow church attendees greeted them, and they walked home together. Earlier this year, government personnel targeted Early Rain Covenant Church last June when they tried to hold a special prayer meeting commemorating the victims of the 1989 Tiananmen Square Massacre. Recently, they have been continuously suppressed and even forced to relocate after authorities pressured their landlord to cancel their lease. One day after the 20 Christians were arrested, more than 30 members of the Bible Reformed Church in Guangzhou were gathered at the home of Pastor Huang Xiaoning when many plainclothes officials harassed them, saying they were there to check firefighting equipment. The church staff asked them to show identification, and Huang refused to allow them to enter. Additionally, national security agents summoned Pastor Li Wanhua of Fengle Church in Jiangmen, Guangdong, for an interview, which lasted one hour and 40 minutes. In it, Li said authorities forbid him from going abroad for theological training and study, and his passport was confiscated. Currently, Fengle Church’s services are extremely restricted. Many congregants worry they may be arrested, and the church can only meet in secret. ChinaAid exposes abuses, such as those suffered by Christians all over China, in order to stand in solidarity with the persecuted and promote religious freedom, human rights, and rule of law.